Babcock Team 31 has today unveiled Arrowhead 140 as its design for the UK Ministry of Defence’s new £1.25 billion Type 31e general purpose light frigate programme. Launching the new platform, ‘Team 31’ – led by Babcock and Thales, OMT, BMT, Harland and Wolff and Ferguson Marine – underlined the vessel’s established, ‘at sea’ design baseline which can be developed to meet global requirements. “With UK engineering at its core, and developing OMT’s Iver Huitfeldt hull form currently in-service for the Royal Danish Navy, Arrowhead 140 will lower programme risks through its tried and tested baseline design and is engineered to minimise through-life costs whilst delivering a truly leading edge frigate. “Arrowhead 140 is a proven, capable, and adaptable general purpose frigate design that, if selected, will meet the UK Royal Navy’s and global customers’ expectations both now and in the future. Arrowhead 140’s distributed build and assembly approach, comprising Babcock Appledore in North Devon, Ferguson Marine on the Clyde, Harland and Wolff in Belfast with integration at Babcock Rosyth, Fife, optimises the partners’ first-class UK facilities, innovation and skills whilst cleverly ensuring capacity for parallel programmes remains say the company. All of which is geared to generate a genuine resurgence in shipbuilding across the UK and when coupled with the virtual design alliance between Babcock, OMT and BMT it squarely supports the intent of the National Shipbuilding Strategy. Incorporating the latest iteration of Thales’ TACTICOS combat management system with fully open architecture sets Arrowhead 140 combat systems apart. And with extensive procurement required throughout the lifetime of the project, opportunities predominantly for UK based small to medium sized enterprises will be available to help to meet time, costs and quality standards. Interest is already strong in Team 31’s bid with more than 100 supply companies meeting Team 31 representatives at a Society of Maritime Industries facilitated suppliers’ conference in Fife. Based on Arrowhead 140, Team 31 can build modern platforms that navies can use to tailor to their own specifications and when you add world leading experience in naval platform in-service support with a deep understanding of support cost drivers, Babcock Team 31 offers a glimpse into an exciting new world of UK and international ship build delivery and intelligent ship support with Arrowhead 140 say Babcock. Looks amazing but I have a hard time believing we can get this for £250million when T26 is coming in at £1 billion. As it is based on an existing design we may well be able to get this for around £250m but not with the same armament as the Danish vessels. Expect to see no VLS except for SeaCeptor, a single phalanx, 30mm canon, and main gun – probably 76mm. The embarked Wildcat will provide the main anti-ship capability. I just cannot see the RN getting any more for the price and this is after transferring much of this from retiring T23s. That contract was signed over 10 years ago and they used armament from retiring ships to save money. An equivalent now would be more like £315m. The Danish ships also have significantly more expensive armament and Radars, so 10 years or no 10 years, they should easily be able to deliver these for the £250mm price tag with a modest armament with plenty room for FFBNW VL silo’s. But as is often said, air is free, steel is cheap. 1) Have they released any details of its proposed specifications (armaments etc) yet? 2) Is it just me or does their design look very Type 26 esque. I think just CAMM for the base. There is room for more silos, Harpoon, CIWS and Torpedoes on the design. This is a slightly larger version of the Dutch Iver Huitfeldt-class frigates, which cost £243m per ship. The Iver Huitfeldt-class are in service with the Danish navy, not the Royal Netherlands Navy. Based on the Danish Iver Huitfeldt frigate…. Apparently the price of those was US$325 or so per unit. Armament isn’t bad either….includes a hull mounted sonar, and Mk 41 VLS. Mk 56 VLS as well…. They did re-use a lot of the weapons systems according to the wiki. I wonder how far we could go with that strategy. Sea Ceptor, 4.5″ gun etc etc? Sea Ceptor is an obvious one, and its radar agnostic, I understand, so no need to develop too much to make it fit rather than ESSM. Its not going to be particularly quiet as a sub hunter though thats a secondary role – CODAD propulsion gives it range but makes it noisy. Might even get it in close to the £250m for the base spec…..
Good point but isn’t it going out of service this year? And the hull and superstructure were built in Lithuania and Estonia so there’s a major cost saving. I was always neutral at best re the concept of reducing the type 26 order and ordering 5 lower cost frigates….. However, i’m coming round to this… from my limited knowledge, am I correct in thinking the Arrowhead 140 design is potentially larger than the type 23? Yep its about 1000 tonnes larger. If we order a relatively large number of Type 31s to bulk the fleet numbers up it will be a good idea. Yep, if Babcock win this you can see the MoD possing the question ‘How much to turn this into a capable ASW platform’ If throwing another 250m per uint at it does the job that makes it almost half the price of a t26, partially built on the Clyde and Rosyth ticks a few other boxes. I am not a naval architect but my understanding is that ASW capability has to be designed in from day 1. It drives both the hull form and the propulsion architecture. The Iver Huifeld hull is, like the T45 an AWD ship and will probably not make a decent ASW ship. Interesting, Navantia are pitching this approach for sea 5000 in Australia, their offering a converted AWD. I’ve read some of the articles on it and most say whilst it may not be as good as the T26 that its up agianst for ASW it would be good enough. We would be making the trade offs more hulls for slightly less capable ASW frigate. We would of course still have some T26 say 6, but could then have 4 more Arrowhead ASW hulls instead for 2 T26. Good points Paul, my point was hypothetical. But Babcocks offering my give us more choice in future. I don’t believe it would ever be as good as a T26 for ASW and that’s the general consensus in Australia also. However, the NSBS does indicate a need to spread the workload around more yards, so from that point of view, a modular build approach is more in keeping. And final assembly will be at Rosyth, so the ships will be built in Scotland, much like the Carriers…. Have you seen the junk they build my god if they are platers or welders then i’m a horses head. So you would strip Scottish yards of the ability to win the contract for simply being Scottish. Are you racists or an idiot? You do know the UK is governed by laws right? FYI about 8% of MOD spending is in Scotland, sure they get more naval work but very little in aerospace and nothing in land systems. Also it nowhere near 90% of naval work, I’m not sure if you are aware (probably not) but barrow is actually in England (north of watford anyway) by far the biggest chunk of UK ship building Budget is going there. Being a sweaty sock is a nationality not a race surely? The MOD need this group of companies to sign in blood that they can deliver this design for £250 million each. Then rapidly order at least 10 ships asap. Well said. I could not agree more. I’m sure they can deliver the design for £250m or they wouldn’t have put it forward (you would think), it just won’t be armed with much! That’s fine, I agree with you. Mr Bell has listed what he thinks the 31s should be fitted with on numerous occasions, I was just telling him that they will not be highly armed as he thinks they should be. Correct me if I am wrong Mr Bell. However, thats bordering on playing fantasy fleets. If the T26 design now is changed, no doubt it’ll cost millions in redesign work. Interesting. Do you know if Cammell Laird could build 2 Leanders in parallel? quick look at the figures for Cammel I would say no. The dock length and breadth are not large enough for a two at a time build even if you stagger the ships in the dock. What about Belfast? Large building dock, with two large cranes in support. Only real trouble there would be that H&W is largely focusing on offshore platforms now. I am not a naval engineer but their web site shows a constuction hall and 4 dry docks. They looked pretty busy when the aerial photos were taken. I wonder that if pushed they could, but not be able to do much else. The way they structure their web site they seem set up for refit work and the odd specialist vessel. It might suit them for Babcock to get the T31 order provided they get some module construction. 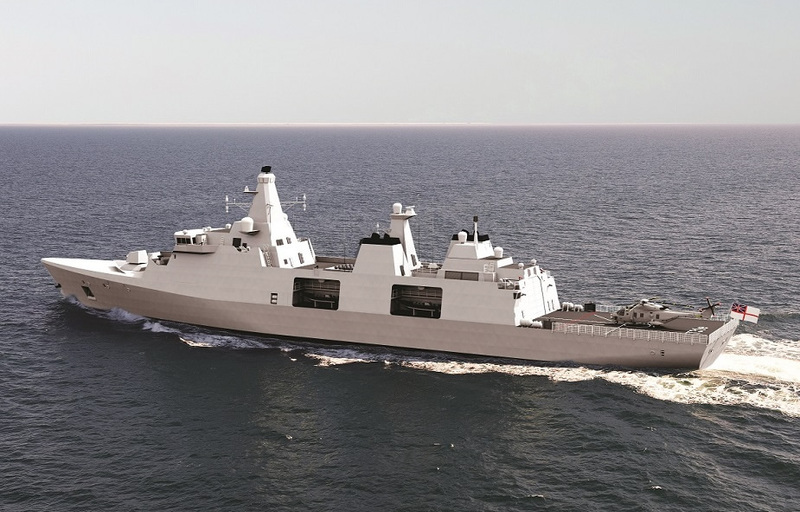 The danish frigate that is the basis of this design is CODAD, MTU diesels, same as T26 is planned to be, although T26 with have Gas Turbines as well. But presumably without the Gucci ASW engine mountings? Yeah, the Danish design is optimised for Air Defence. The T31 will be noisy for a primary ASW role, but presumably that is the T26’s job. Like the T45s, the T31 will have some ASW capability as a back up. Its primary role is to operate in the forward presence/flag waving role and able to defend itself until the Carrier Battle Group can deploy. 6500 tons is a big anti piracy flag waver. Yep, thats true…. maybe it doubles as a mother ship for MCMVs and OPVs? Thats what the mission bays are for…. Andy, you are incorrect. The type 26 is gas turbine or diesel electric. The Arrowhead 140 is direct diesel. Big difference. Sorry, my post wasn’t very clear. The MTU diesels will be used in both T26 and T31, but you’re right, ArrowHead 140 will be diesel only, while T26 will have the much higher end setup of Diesel Electric and GT…. Diesels driving a Controllable Pitch Prop. Thats the only way to do pure direct drive diesels. Engines into a gear box with a CPP on the end of the shaft. For comparison Khareef has 2 5.4kw diesels. I am guessing Leander will be similar. Iver Huitfeld has 4 8.2 kw diesels. How would the fuel consumption of Leander and Arrowhead compare? If the Type 31 is going to be this size then they should probably make shore the hanger can accommodate a Merlin. That way if we need a anti sub capacity and have no type 26 available, then a type 31 with a Merlin would make a good stand in. 8 extra Merlin does not replace 28 Wildcat HMA8. Do let’s upgrade the remaining Merlin if they have not been cannibilised to bits as we need them, but leave Wildcat/ Martlet Sea Venom as is for our escorts, T31 especially. Sea Ceptor can be quad packed into each Mk 41 Cell, so maybe thats the sensible option? Fit the T31 with 16, 24 or 32 Mk 41 cells and then you have the flexibility of Sea Ceptor and hopefully in future some next generation Anti Ship missles for offensive punch. Incidentally, Sea Ceptor quad packs in the Sylver VLS on the T45 as well, doesn’t it? Maybe thats a way for the T45s to bulk up their operational defensive capability – run a mix of Aster 30 and Sea Ceptor in place of the Aster 15. In an ideal world, I agree, Mk41 on the T45 – potentially to provide offensive capability in the form of a future AShM, as well as Sea Ceptor to bulk up the missile count. ExLS is a standalone unit, isn’t it – you don’t need it if you have Mk 41? Or have I got that wrong…? Thanks Julian, thats useful…. seems to be a sensible compromise for T31. That and maybe some scavenged Harpoons from the T23s until a new missile is procured….. If you only plan on Sea Ceptors, ExLs is also a waste of money. It’s value lies in being able to launch many types of missiles. A good point, and no doubt it’d come down to cost, but ExLS gives a cheaper variation on FFBNW – if they are included, then there is an option later to expand the weapons load. Point taken Ron. Out of interest, what else can ExLS fire? It’s soft-launch only I think so, with my very myopic UK-focussed (scant) knowledge of missiles I’m struggling to come up with anything else. Check out the Arrowhead 140 website. It shows the VL is located behind the bridge and mast and forward of the hanger. Not the bow. I think the Leander rendering hints at the same idea. I would have preferred if they built the Type 31’s like the Absalon Class Support Ship. The added flex deck would have gave the ship extra adaptability options like a light amphibious vessel, mothership (for unmanned vessels or CB90’s), humanitarian relief, hospital ship or mine layer/sweeper. The design being based on the Iver Huidfeldt class would save on costs for a batch 2 “Absalon variant”. RN need ships in the water. Now watch RN / Mod make a pigs ear of it! Would be good. But personally I’d say a need more then 8. I would personally like to see Cammel Laird/A & P Tyne get the Type 31s and the Rosyth consortium, with their large dry dock and gantry crane, get the fleet solid support ships. That would really revive shipbuilding around the U.K. I agree. That would be a neat solution. The theory with the T26 being cut to 8 was because it was too big and therefore perceived as expensive because of that. The Arrow 140 design is only 10m shorter. Hopefully this doesn’t become an issue when it is considered. And yep, we all know that air and steel are relatively cheap, so size isn’t in fact that important when it comes to warship cost. Hence my use of the word “perceived”. The more space in a ship at the start of its service life the better; then it can be upgraded more easily in the future. The T31 RFI ‘adaptable’ requirements call for FFBNW a bow sonar. Block building is meant to increase quality while reducing costs. Good comment Julian. I like your “glass jaw” analogy. Very apt. I am not expecting there to be much in the way of armament on these ships, but as many of you have said there is plenty of space for future upgrades. That said, can anyone name an instance where something was “fitted for but not with”, then actually fitted for it later? Harpoon on 4 of the T45s… crap example, but it’s there. Taken from the last of the T22s, I think…. Can’t think of any other examples though…. Bad example. The T45’s were not FFBNW Harpoons any more than the Type 23’s were. The canister Harpoons are designed to be dis-mountable and are installed based on mission. And no, I can’t think of any FFBNW that were later installed. I imagine the Treasury saying every time: “you’ve done without it so far, so let’s continue”. Just as a reality check this is what was being asked for. 4000 tons, around 115m a crew of less than 100 and a range of around 6k nm. What Babcock are proposing is more like a Type 45 successor; Iver Huitfeld is an AD hull form at 6500 tons with 4 diesel prime movers rather than 2, a crew of 180 and a range of over 9000 miles. Has the requirement changed or has the method of contruction and leapfrogging RN and MOD long term strategy assumed a higher importance than what is being constructed? Yeh. We need to decouple what is being built from how it is built. If they can at least hit the crew requirements and the £250m base price without sacrificing too much, this size design might still be a winner. AH, you got there before me as I was typing my much longer reply. Interesting to see you mention crew as well Andy. That does seem a concern with this big a vessel. Type 26, incidentally will have a crew around 118, with room for 208….so I suspect it is doable, just about. And Paul bought it up in the forst place. Paul- Wikipedia (groan – I know!) says complement 165 and crew 117 so I’m assuming the 48 difference is spare bunk space and maybe whether a helicopter is embarked or not and what other Stanflex systems are onboard. I doubt there would be competition between the designs. The Iver Huitfeldts are a class of highly advanced AAW vessels. T31 is obviously going to be a much more basic general purpose design, so even though they are in the same weight class, their roles vary significantly. Why use a SeaCeptor at say 200k a pop to kill a Boghammer? Remote control 30mm guns and Phalanx can do it for a lot less money. Its a lot easier to shoot a boat up and unlike a missile that is radar homing, you can see what you are hitting with a gun. Gunbuster – What are your thoughts on the Sigma mount adding LMM/Martlet to a 30mm installation? I wonder why the RN is bothering to look at the anti-ship capability of SeaCeptor though? Rob, I didn’t think it was due to budget? Judging from the marketing departments ..”embedded iFrigate™technology” .. i do hope sales is up to it. Paul, that document is an RFI: request for information. Designed to give interested parties an idea of what the MoD has in mind. Not a specification for bids. In order to keep the costs low for construction will the Type 31 will they be using a Stanflex module approach in regards to the ships weapon systems? It sounds nice but LCS has put me off modularity within warships completely. The US have made the mistake and are spending vast sums of money to rectify it, I see no reason why we should make the same mistake. Seems to work for the smaller number of ships in the Danish Navy…. we aren’t going to have many more than them soon! If the MOD is aiming for 5-10 ships. The first 5 (Iver Huitfeldt variant). The next batch should be based on the Absalon. The added “Flex Deck” will boost (temporarily) the reduced capability gaps with the loss of HMS Ocean (and other fleet losses). The capability of a 24 hour conversion to a personnel/vehicle transport (300 troops/55 vehicles or 7 MBT), hospital ship or whatever is a no brainer. I just hope they have a reduced acoustic signature to make it a capable general/ASW platform. M Heron – are the Absalon’s a variant of the same design? Only downside I could see is that there would be further design/development costs for a different sub class? The Iver Huitfeldt is based on the Absalon class. The Absalon Class was built in 2003-04. The Iver Huitsfeldt Class was built in 2008-2011. The class is built on the experience gained from the Absalon-class support ships, and by reusing the basic hull design of the Absalon class the Royal Danish Navy have been able to construct the Iver Huitfeldt class considerably cheaper than comparable ships. So hopefully if they go for a Absalon variant for batch two they could do the same but vice-versa. This probably won’t be popular but my money is still on Leander. Solely British design and distinct in the export market. It also uses the same combat systems as other RN ships. If both designs are similar in terms of cost, armament and flexibility then I can see Leander being preferred. I suspect it is the most mature and combat oriented design. I wonder if this new Babcock design could accommodate the RN combat system. I’m guessing that’s not a huge change to make. Could be very wrong tho. I think politically its impossible. This team was going to win from the start. Deals have been done. Paul P – without wanting to muddy the waters (no pun intended lol) I think the PPA will be the first to commission ,construction started last year. Apart from the sizing, how does this U.S. Huntington Ingalls corvette built for the Israelis stack up? I’ve always thought it’s a neat design packing a lot of punch for its size. I’d think this could easily fill the requirement for a light patrol frigate with a few mods. was wrong with the all British Venator design? Venator was the independent BMT design and now they’ve decided to consortium up with Babcock etc so have gone with a new design, hence Arrowhead 140. There was nothing wrong with the Venator design just the consortium decided not to go ahead with it. So happy families then with Babcock, BMT and OMT? I think Venator was a bit of a concept, but had elements of modularity that could maybe be including in this Arrowhead design. But I could be wrong. The original Arrow head wasn’t far wrong, this model is the business! I don’t tead things that way. I believe the original Arrowhead was an attempt by Babcock to reuse the VARD design work for the USCG Offshore cutter. And that this hull was immature and therefore dismissed by customer. But since BAE Leander was the wrong political answer Babcock went away to look for a mature hull design and found one through OMT. So this submission has the same Arrowhead name but bears no relarion to the first attempt. If this submission proves anything it is that BAE have forgotten more about warship design than Babcock will ever know! Looks like it would be a fun ride if fire broke out. Distinctly lacking in fire proof fixtures & fittings. Its got the most advanced fire detection system apparently. Every inch of it is covered in cameras. Solid and safe seems the way to go…kind of like the original plan for T26 – reuse existing tech to reduce costs. Interesting how that worked out! This either highlights that we are over paying for the T26’s or that there is much not included weapons and sensors wise. The increased size is not going to drive the cost – steel and higher rated propulsion is not the expense – that is standard merchant ship stuff. Not sure I like the rendered graphics however as the silos seem to be sitting over the midship hangars with nothing under them…? Those mission bays are not the width of the whole ship, there is a space between them for the silo. My understanding is type 26 design costs are all about making the ships super quiet extra damping etc. But no doubt as most have stated and hmg seems to be realising we have overpaid due BAE having a monopoly of course more steel costs more but steel is cheap compared to combat systems and it seems asw measures I am not sure about propulsion as wouldn’t the mtu be standard choice it could mean they are slower though? The news we have all been waiting for. This is a world beater and will revive our entire navy and ship building industry. We are going to be churning these out by the cusomised blocks. Manning is going to be crucial, can automation get us to a crew of 100? I believe so. Surely there is room for 100 marines too? Danish world beater…fixed that for you. Wouldn’t Samson be a better option for a future AAW version, given its already in service? I don’t think Leander has this anywhere near in the bag. With Babcock spreading work across 4 locations (including Belfast) it will be much more appealing politically, the defense secretary did not Visit H&W for the first time in 20+ years because he wanted to go site seeing. Now that the Babcock consortium has offered a credible and in my opinion superior design it has a very strong chance. Right. It has been a political done deal from the start. And when in the first round the Leander hull beat the US Cutter based hull of Arrowhead Babcock were given time to submit son of Arrowhead. T31 is less to do with the ship and more to do with the ship building industry. Thanks. Is it possible to say whether the BAE or Thales system is better or is it too complicated with so many different aspects to consider with one system better in some areas and the other system better in other areas such that it’s not really possible to call a clear winner? Standards reduce cost and improve reliability. I can’t imagine the RN agreeing to a fleet of 5 ships with an orphan CMS. As I see it BAe would have to be part of the Babcock consortium to do the systems integration. Not to mention Artisan which is also really the RN de facto standard large ship situations awareness radar. Perhaps they’ll pretty much lift and shift all suitable technologies from teh GP T23s? 4.5″, Sea Ceptor, Harpoon, Sonar (do the GPs have a hull mounted Sonar? ), radars, etc etc…. If the RN are happy with the seakeeping, stiffness and resilience of the hull and economy ( 4 big diesels! ) and there is an electric drive option for ASW export customers and it has Mk8 gun, BAe CMS, Artisan and Sea Ceptor and the Rolls Royce (Leander/ T26) mission bay and this can all be done for under £250m a pop then I would swallow my objections to it being a Danish hull. The core T31 RFI calls for FFBNW bow sonar. Nice to have though. Babcock have obviously done the maths and feel the extra tonnage can be offset. I would kinda agree. You pay more for the steel and a small % more to process (cut and weld) it but if you have more space in the vessel is easier to work on, making fit out easier (quicker). Extra space may also allow for more off the shelf equipment non combat , ie galley, waste processing, laundry etc. frigate design and been able to remove cost to get what looks like a very good t31e design. Whilst BAe have upgraded an OPV, why have BAe not looked to down spec the t26. The cynic in me suspects BAe could have done this but it would have exposed them to too many questions about what we are getting for 750m more for a t26. The Thetis class is built for fishery patrolling in Arctic waters, though, with a very different and very strengthened hull design and less armaments. Not sure a Ivar Huitfeld hull would work for that mission. 1) A lack of long term planning and strategy by government Which means companies can’t plan ahead. BEE being a monopoly doesn’t help, but successive governments have brought it about. In order to overcome this there has to be more orders. I admire the ambition but at the moment we cannot afford the current equipment plan for 5 of these, let alone another 10. Batch 2 and 3 would likely be considerably more expensive too. Still, I hope it comes true! At least they had one ready to go (a good one too).